7 Days of “Done for You” Content to help you grow your list & inspire activity in your community. 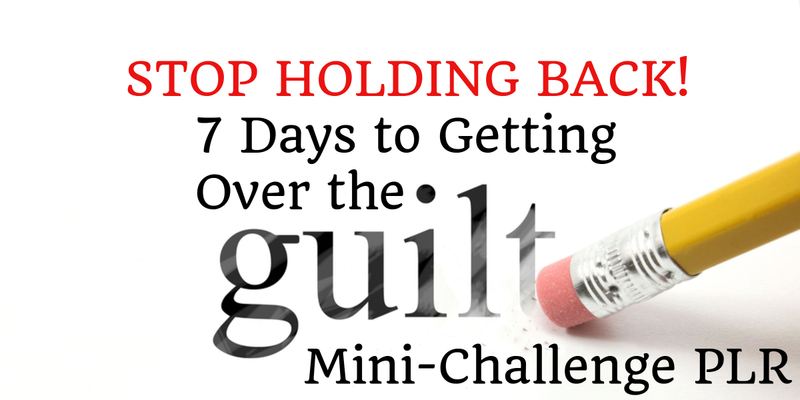 Our 7 Day Getting Over Guilt Mini Challenge is designed to give you a taste of our content and to help you to grow your list and inspire activity in your community. By far our favorite way to grow our reach and create engagement with our target audience in any niche is running a challenge. The idea is to post something on a topic each day for 7 days both on a blog, and on social media. In the content you share helpful tips and advice and to go along with it, emails go out each day that point readers to the new content and challenge them to follow along. Whit this content bundle, you challenge your readers to learn more about self-confidence and courage over the course of a month. What Is Guilt And Why Does It Hold You Back From What You Want To Do? It's a good mix of content that your audience will enjoy. Since the articles also go up on your blog and can be shared via social media, this is a great way to grow your reach and attract new readers. This could be a free challenge to help you build your list and grow engagement with your readers, or it could be a paid product for a business or marketing coach. The content could also easily be turned into a 7 day group coaching program on making over your email autoresponder. Along the way, you can of course monetize your emails with suggestions for different books, courses and tools. If you know how to copy and paste, you can set up this 7 day autoresponder audit challenge. Keep it free or make it a paid product. We put together a “how-to” guide to help you implement this PLR and use it to grow your list. Use it for this challenge, but also for any other 7, 15 or 30 day email challenges you may want to run down the road. We've even included a section on how to write the content for your challenge yourself. We share everything we do to run and promote these challenges and grow our lists fast. Frankly this bonus alone is well worth the price of the entire PLR bundle. To recap, you’ll get the full 7 articles as a word document and txt files. You’ll also receive 7 email messages to promote the blog posts. Get this 7 Day Getting Over Guilt Mini-Challenge PLR Bundle PLUS BONUS for FREE- and Start Growing Your List Today!